A couple of weeks ago I was perched on a bentwood bar stool at my favorite local watering hole, trading thoughts on cocktails with bartender David, when the phrase “Astoria Distilling Company” was casually dropped into the conversation. It took half a moment for the words to make their way around the cocktail I was sipping, but when they did, my ears perked up. You can guess what spirit was involved in my second drink of the evening. Yes, folks, the day has finally come: the borough of Queens has a distillery! After a year of development and a recent financial boost the Astoria Distilling Company is now rolling out bottles of booze, with owner and Astoria resident Chris Murillo at the helm. While the actual distillation is currently taking place upstate (in Rochester), a local facility (and a selection of Astoria-inspired spirits) is in the works. Soon, locally-made liquor will be winding its way down our blocks and avenues and into the waiting glasses of spirit-loving Queens barflies. Given the current boom in microdistillation and the fact that New York is a major metropolitan hub of the culinary and beverage world, I think it was only a matter of time before craft spirits made their way to our humble corner of the Outer Boroughs. A change for the better, I say — a way to quietly make our way into the NYC spirits & cocktails scene. (This seems like an ideal point to take a dig at Brooklyn, but I’ll restrain myself). Appearance: Perfectly clear, slightly viscous in the glass. Nose: Rather light intensity, hints of honey, lemon peel, juniper and resin; touches of cedar and oak, suggestion of malted grain. Taste & Mouthfeel: Light sweetness, which is round and honeyed, slightly velvety, that hits in the middle of the tongue and lingers in the top and back of the throat when swallowed. Taste is of floral honey and lemon, juniper, and suggestive of hay or leomongrass, perhaps lemon verbena; hints of new oak on the finish. Has a decent amount of “cut” or alcoholic edge befitting a 90-proof spirit, though certainly not hard-edged like a high-proof bourbon. So, how does Queen’s Courage stack up against other Old Tom gins? It’s less direct than Hayman’s Old Tom ( long the go-to spirit in the category), which is more straightforward and sugary in its sweetness, with a juniper- and orange-heavy flavor. 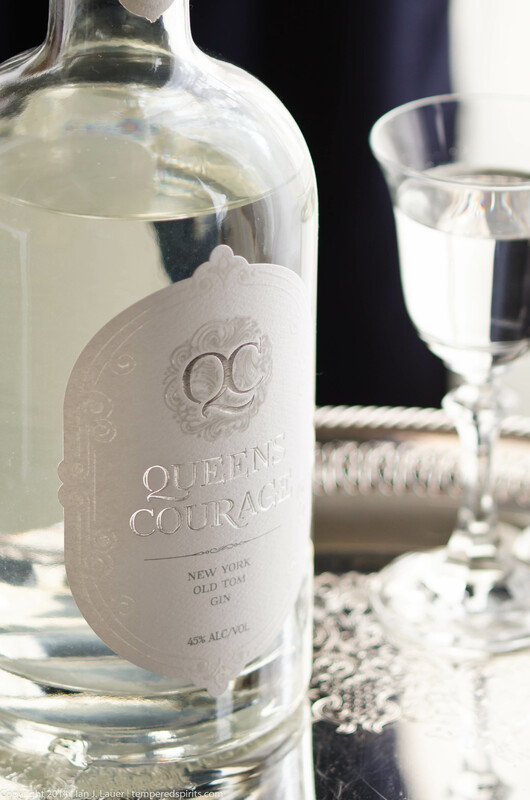 While Queens Courage features malty, herbal notes similar to Ransom Old Tom, it is more understated, less edgy. And it is certainly more subdued than Barr Hill’s Tom Cat gin with its lip-smacking flavors of honey and pine sap. All told, it’s a welcome addition to the world of Old Toms, being subtle while retaining a delicate complexity. Shake gin, Suze, and lemon with ice, pour over fresh ice in a Collins glass, topping off with ginger beer, then stir briefly to combine. Garnish with a lemon wheel, if you like. Original recipe, refined after talks with the folks at Mar’s. I was trying to keep the gin at the forefront here, which explains the small amount of Suze and lemon. If you’re using a heavier Old Tom like Hayman’s, you’ll need to up both of those to 3/4 oz, at least. The Queens Courage is light enough that the Suze still comes through, its flowery, gentian bitterness offset by the ginger beer and gin. Actually, my favorite thing about the Cato is the honey-ginger-lemon combination, along with the fact that it’s a longer drink meant for refreshment — the type of cocktail that I make all too few of, favoring compact, boozy, heavy-hitters, more often than not. The cooler is named, of course, after Inspector Clouseau’s faithful, ambush-loving manservant Cato, from the Pink Panther films (I figured it worked well for the blend of Suze, fron France, and ginger, from the Far East). For all you folks here in New York, Queens Courage is slowly trickling through the neighborhood bars (Mar’s, Bowery Bay, Bourbon and Vine, Sparrow Tavern) and booze shops (Astoria Park Wine & Spirits, Astoria Bier & Cheese), but I haven’t run across it beyond our borough’s borders…yet! I’m sure that’s due to change, especially once the distillery relocates here. That being said, if you do venture out to these parts, stop at a local watering hole and raise a glass filled with the spirit of Queens — it’ll be worth the trek. P.S. Founder Chris Murillo has also mentioned that the ADC plans to craft additional spirits, such as ouzo, that reflect the diverse cultural background of Queens…I can’t wait to see what they cook up! Correction (9/15/2014):: While describing the Cato Collins, I referred to the gin as “Queens Comfort” rather than “Queens Courage.” It’s a hard habit to break when the restaurant is right down the street. The Cato Collins sounds wonderful. 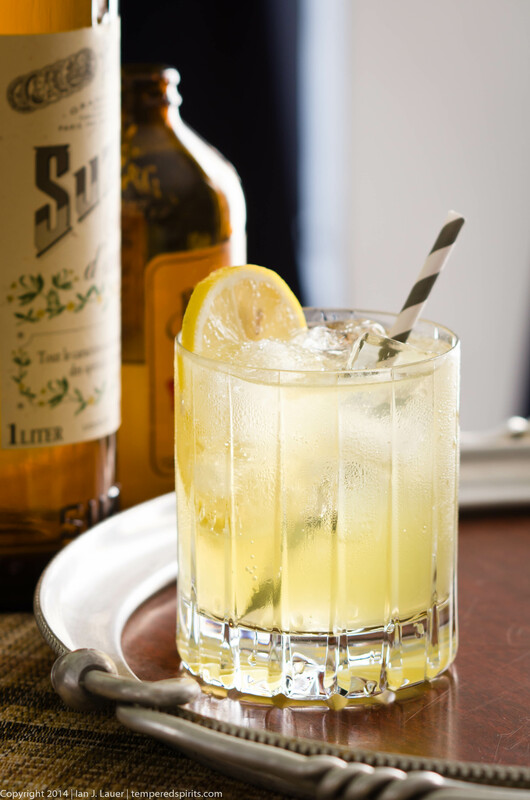 This entry was posted on September 14, 2014 by IJ Lauer in Drink Recipe, Gin, Ginger Beer, Lemon Juice, Original Drinks, Spirit Information, Spirit Tasting, Suze and tagged Astoria Distilling Company, cocktail, gin, ginger, lemon, microdistillery, new york city, queens courage, recipe, spirits, suze.